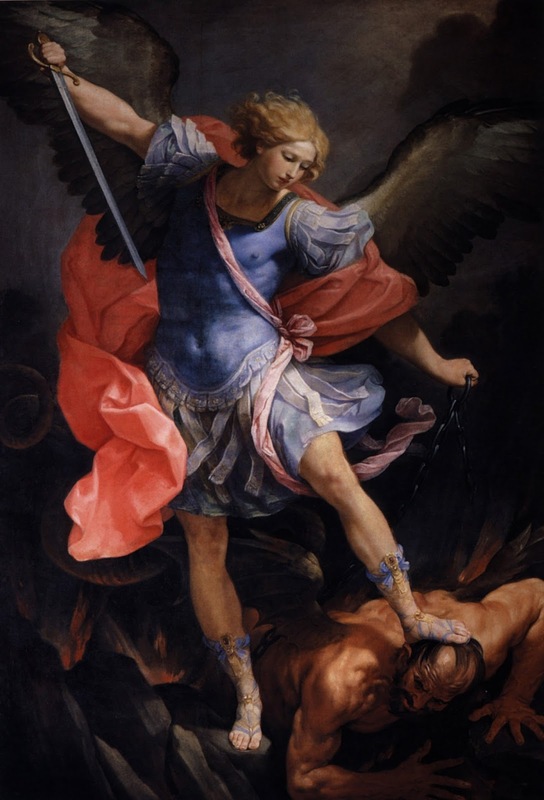 The Archangel Michael is mentioned three times in the book of Daniel, once in the Apocalypse, and once in the Epistle of St Jude, and these are all of his Biblical appearances. Both New Testament authors introduce him quite abruptly, taking it for granted that their readers already know who he is. “And there was a great battle in heaven, Michael and his angels fought with the dragon…” (Apoc. 12, 7) This would certainly be due to his prominence in pre-Christian Jewish literature, works of the sort which we now call (rather inexactly) apocrypha. And indeed, the mention of him in the Epistle of St Jude is taken from such a work. “When Michael the Archangel, disputing with the devil, contended about the body of Moses, he durst not bring against him the judgment of railing speech, but said: The Lord command thee.” (verse 9) These words refer to an episode in a Jewish apocryphal work called The Assumption of Moses, which is only partially preserved; it is not in the part that survives, but ancient scholars such as Origen, who had the complete text to hand, say that it is in the work cited by St Jude. One explanation of the story is that the devil sought to claim possession of Moses’ body as that of a murderer, since he had killed the Egyptian, (Exod. 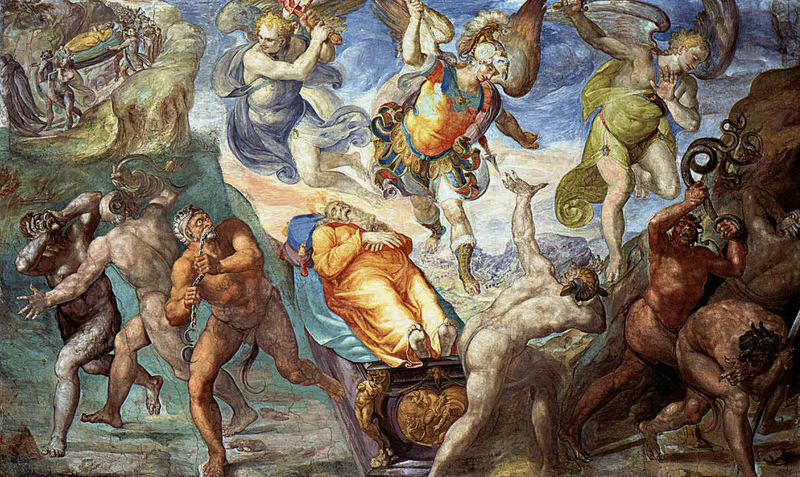 2, 11-12), and it was for this that St Michael said, “May God rebuke thee.” (In this context, it should be remembered that the Greek word “diabolos” means “slanderer.”) Another explanation is based on a tradition which goes all the way back to Tertullian, that idolatry was taught to mankind by the devil; therefore, in the story cited by St Jude, the devil’s purpose in trying to get the body of Moses would be to have the Jews worship it as an idol. The story has attracted almost no attention from artists, with one very prominent exception, a fresco of it in the Sistine Chapel. When the chapel was originally constructed, Pope Sixtus IV (1471-84) commissioned a group of some of the most prominent painters of the era (Sandro Botticelli, Domenico Ghirlandaio, and Perguino among them) to paint eight episodes each from the lives of Moses and Christ; they are paired to show how the Church understands the life of Moses, the lawgiver of the Old Testament, as a prophecy of the life of Christ, the lawgiver of the New Testament. The final two, however, The Dispute over the Body of Moses and The Resurrection of Christ, break the parallelism; Moses, the giver of the old Law, dies and stays dead, but Christ, the giver of the new Law, rises from the dead. These last two are on the chapel’s back wall, which has a large door in the middle, under part of each of the paintings. On Christmas Day of 1522, the architrave over the door suddenly cracked and fell, just after Pope Hadrian VI had passed under it while processing into the chapel to say Mass. (Two of his guards were killed.) This break would eventually lead to the complete deterioration of the paintings; around 1575, Matteo da Lecce replaced the original Dispute over the Body of Moses with the same subject, but in a very different style, as Hendrick van den Broeck had done about 20 years earlier with the Resurrection. St Michael also figures very prominently in another apocryphal work, The Testament of Abraham, which exists in two recensions; the longer of these mentions him 24 times, the shorter 44 times. The basic idea of both is that he is sent to Abraham, whose life is extended from the Biblical 175 years (Genesis 25, 7) to 995 in the long recension, to persuade him to accept that his time has come to die. When Abraham’s son Isaac comes to meet the Archangel, the latter says to him, “the Lord God will grant you his promise that he made to your father Abraham and to his seed.” (chapter 3) Later on, Abraham meets Death himself, who appears to him with the heads of various animals, including a “terrible lion.” (chapter 17) Finally, when Abraham dies, “the archangel Michael came with a multitude of angels and took up his precious soul in his hands … and they tended the body of the just Abraham …. but the angels received his precious soul.” (chapter 20) These passage were clearly the inspiration for the first part of the Offertory chant of the Requiem Mass.